I love cakes, and there is nothing nicer than a spot of afternoon tea. But where to get your cakes from? 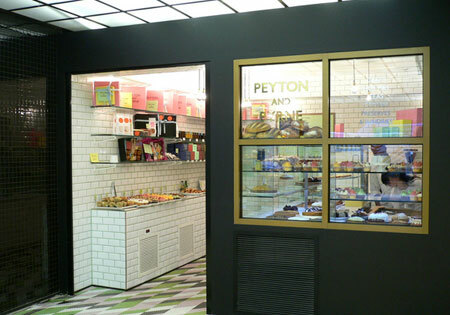 Well if you are in London, and anywhere near Tottenham Court Road, then why not give Peyton and Byrne a try? The Peyton and Byrne bakery is situated in entrance to the Heal’s building so you can combine cakes, and browsing for great home design. The design of the shop complete with retro brick tiled walls, and gorgeous displays of cakes, breads and savouries is enough to test the willpower of all but the most hardened dieter. The array of old fashioned victoria sponge cakes, bakewell tarts and even fig rolls will ensure that you don’t leave empty handed. Make sure you take a look next time you are down there and you won’t be disappointed. I thought that the location and design of the bakery were spot on and after several minutes of drooling by the window my partner and I went inside and purchased a fairy cake each. We were so disappointed! There was far too much icing on top, and it tasted cheap and artificial. It was so sweet that by the time you’ve eaten it all you can’t face eating the actual cake! When we had gotten down to the cake we were very disappointed. The middle was under cooked and the outside was dry and crumbly. They certainly did not taste ‘freshly baked’ as they perport to be, they didn’t even taste like chocolate. Afterwards we felt a bit sick. I certainly will not be buying their fairy cakes again (especially at £2.50 a time) as for that price you would expect something that did’t taste like it had been baked by a 5 year old a week ago. Perhaps we were unlucky though as everything else looked fabulous, so I will be trying out other things, just not the fairy cakes. They have the best victoria sponge cake ever, large for 9 pounds and small for 2.50. I go whenever I can. Nice bag and packing too, so retro. compact, beautifully presented bakery, bursting with amazing flavour. Such a lovely, indulgent treat, yum!